Since late December, silver and related precious metal commodities have proven to be some of the best investments for those looking for a hedge against geopolitical uncertainty and heightened market volatility. While prices have rallied tremendously over a short period of time, in this article, we’ll take a look at three silver-related charts that suggest the move is just getting started and try to determine how active traders will want to position themselves for a long-term uptrend. It wasn’t a particularly good year for silver and silver-related investments in 2018. The strong rally that started in September helped many recoup some major losses, and the momentum has continued to benefit investors so far in 2019. 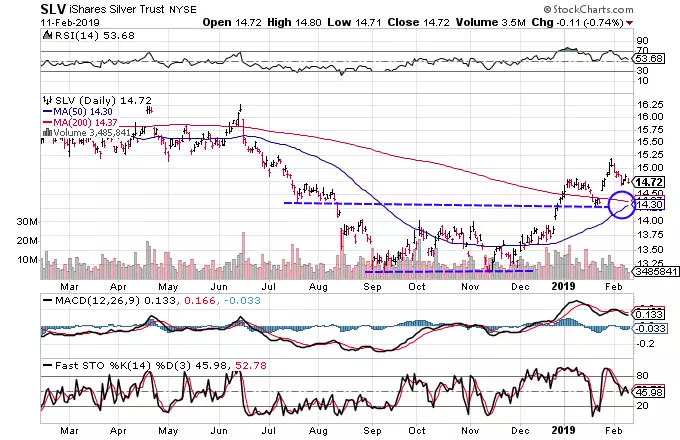 Taking a look at the chart of the iShares Silver Trust (SLV), a common barometer used for measuring the day-to-day movement of silver bullion, the price has been able to break above two key levels of resistance. The break above the 200-day moving average in late 2018 and subsequent retest of the newly formed support is a significant technical development and suggests that the bulls are now in control of the longer-term direction. Active traders will be particularly keen on following the rising 50-day moving average, which looks poised to move above the 200-day moving average at some point this week. When it occurs, the bullish crossover will be referred to as a golden cross and is a technical signal that officially marks the start of a long-term uptrend. The proximity to the major support levels to current prices is providing followers of technical analysis a lucrative risk-to-reward ratio, and many will look to see if the crossover will be the catalyst required for a move back toward the January high and above. One of the world’s leading mining companies when it comes to precious metals such as silver is Wheaton Precious Metals Corp. (WPM). 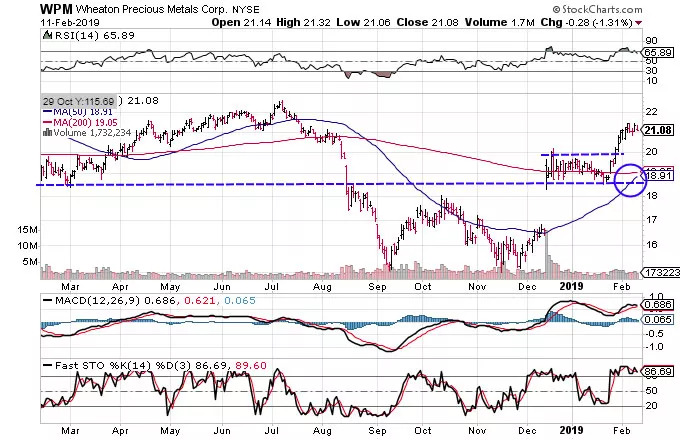 Taking a look at the chart below, you can see that the breakout in December was strong enough to send the price of the stock above the resistance of its 200-day moving average. The price consolidated along its 200-day moving average for several weeks until it started its trek higher. The break above short-term resistance was a clear sign to the bulls that prices were headed higher, and the momentum is likely enough to trigger a golden crossover between the two long-term moving averages, as shown by the blue circle. Followers of technical analysis will likely keep a close eye on this chart because a crossover will likely be used as confirmation of a move higher and will likely mark the start of a long-term uptrend. 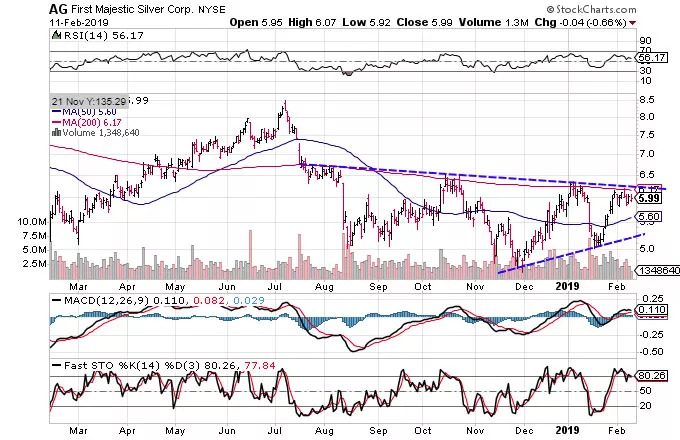 Another significant player within the silver market that active traders may be interested in following is First Majestic Silver Corp. (AG). While the pattern isn’t quite as developed as those mentioned above, the confined range shown on the chart is a clear indication that a major move in one direction or the other is imminent. The several failed breaks above the resistance of the 200-day moving average suggest that the bears are in control. However, if the other charts are any sort of indicator, a break above $6.17 could be the catalyst needed for a reversal in sentiment and likely a sharp move higher. There are few segments of the financial markets in which traders are able to find shelter from the rising levels of volatility and uncertainty. With that said, the patterns that have recently started to show on charts of major silver assets suggest that the move higher in this niche could be in the early days and poised to continue over the coming weeks or months.